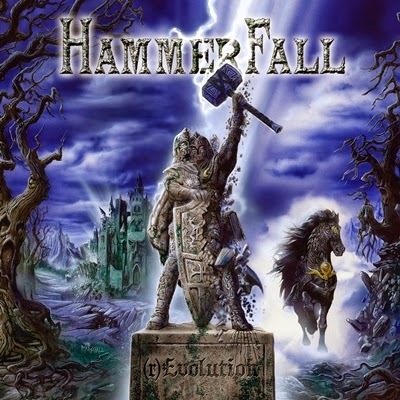 Metal Messenger - Metal & Hard Rock News: ALBUM REVIEW: HAMMERFALL "(R)EVOLUTION"
Sweden's Hammerfall return with their first album since 2011's “Infected” and what a return it is! Track number one is the epic, uptempo “Hector's Hymn” will likely forever be in their live set. This is one of, if not the best Hammerfall track I've ever heard. This track alone will get the band booked at every one of those European festivals next year. For those readers who've never heard Hammerfall, the best I can describe it is a mix of classic traditional metal and power metal. Think Saxon blended with Manowar. They deliver songs with big melodic choruses and lots of warrior testosterone. This can be heard on many of the songs including two other stand-out tracks “Bushido” & “Live Life Loud”. I felt the first half of the album was stronger than the second, but Hammerfall have certainly come back with a solid release. Battle on! Out August 29th! Watch Hammerfall in the studio making "(r)Evolution" below.